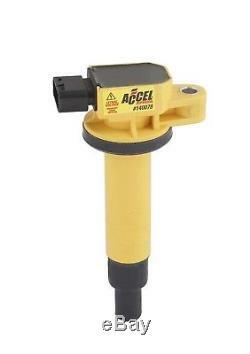 Ignition Coil-Super Coil ACCEL 140078. Marketing Description - 2000 : Supercoils produce up 15% more spark energy then OEM, better throttle response, maximize fuel mileage, less than an hour to install. Associated Comments - 2000 : Up To 15 Percent More Spark. Country of Origin (Primary) : CN. Harmonized Tariff Code (HTS) : 8409915085. Harmonized Tariff Code (Schedule B) : 8409915085. Life Cycle Status Code : 2. Life Cycle Status Description : Available to Order. NAFTA Preference Criterion Code : B. National Popularity Description : Last 5% of Product Group Sales Value. Product Description - Extended 240 : COIL;COP TOYOTA. Product Description - Long - 80 : Ignition/Electrical. Product Description - Short - 20 : Ignition/Electrical. See Item Specifics section for additional specifications about this part. To confirm that this part fits your vehicle, enter your vehicle's Year, Make, Model, Trim and Engine in the Compatibility Table. Also review the notes section in the compatibility chart for additional specifications about this part. This part generally fits Scion, Toyota vehicles and includes models such as Echo, Prius, Prius C, xA, xB, Yaris with the trims of Base Hatchback 2-Door, Base Hatchback 3-Door, Base Hatchback 4-Door, Base Hatchback 5-Door, Base Sedan 2-Door, Base Sedan 4-Door, Base Wagon 4-Door, CE Hatchback 2-Door, Core Hatchback 4-Door, Core Sedan 4-Door, Four Hatchback 4-Door, L Hatchback 2-Door, L Hatchback 4-Door, LE Hatchback 2-Door, LE Hatchback 4-Door, One Hatchback 4-Door, Premium Hatchback 4-Door, Premium Sedan 4-Door, RS Hatchback 2-Door, RS Hatchback 4-Door, S Hatchback 2-Door, S Hatchback 4-Door, S Sedan 4-Door, SE Hatchback 4-Door, Three Hatchback 4-Door, Touring Hatchback 4-Door, Two Hatchback 4-Door. The engine types may include 1.5L 1497CC 91Cu. L4 ELECTRIC/GAS DOHC Naturally Aspirated, 1.5L 1497CC 91Cu. L4 GAS DOHC Naturally Aspirated, 1.5L 1497CC l4 ELECTRIC/GAS DOHC Naturally Aspirated, 1.5L 1497CC l4 GAS DOHC Naturally Aspirated. This part fits vehicles made in the following years 2000, 2001, 2002, 2003, 2004, 2005, 2006, 2007, 2008, 2009, 2010, 2011, 2012. Electrical parts are non returnable. The item "Ignition Coil-Super Coil ACCEL 140078" is in sale since Saturday, April 22, 2017. This item is in the category "Automotive\Parts & Accessories\Car & Truck Parts\Ignition Systems\Coils, Modules & Pick-Ups". The seller is "buyautopartscanada" and is located in Saskatoon, Saskatchewan.